The flexibility of our MMSTM LNG Plant allows the optimal balancing of the various gas/well inflow pressures and flows to reduce the compression required for operation. With the addition of a Chester LNG pretreatment process to provide additional gas clean-up the MMSTM LNG Plant can be used for liquefaction of wellhead gas. Chester LNG high efficiency storage tank systems are designed for a range of locations and applications. Off-shore storage can also be provided, where required. LNG dispensing stations have the capability to provide either LNG or CNG. The elegant simplicity of the Chester MMSTM LNG Plant design translates into ease of operation. Key active control points enable it to operate in a stand-alone mode with minimal operator input and control. Chester LNG includes remote monitoring for each system with data sent back to our corporate operations control room. Fully automated system design means a simplified process for our customers. Our customized LNG system packages are designed to address the required efficiencies of your specific application and infrastructure requirements. 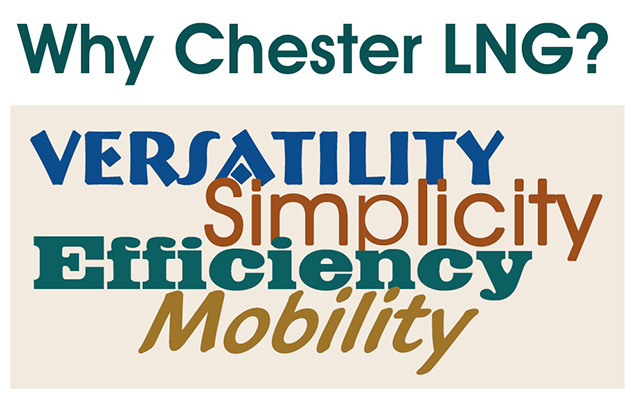 Increased efficiency in Chester LNG’s overall design means better economics in meeting your energy requirements. Reduce your emissions by harnessing cleaner burning natural gas. Floating LNG storage and regasification systems eliminate burdensome receiving terminal infrastructure costs. Save time and money by coming to Chester LNG, the one-stop-shop for superior equipment and trusted engineering solutions. We are the only LNG system supplier that can service every aspect of your natural gas usage needs. The MMSTM LNG Plant can be containerized and/or skid mounted, making it transportable by land or sea. Given its compact size, the MMSTM LNG Plant is the ideal technology to service remote locations where gas lines are not available to move gas from wellhead to market. Wellhead LNG (from stranded wells) can be transported to its final destination using our high efficiency LNG intermodal tank system. Chester’s smaller sized supply vessels can transport LNG to customers around the globe.